This medium crystal or caramel malt provides residual sweetness and body. It also imparts moderate golden color. Using crystal malts helps head retention by contributing intermediate-size unfermentable sugars (dextrins) and complex proteins. Therefore, crystal malts are useful in most beer styles. In general, the total amount of crystal malts should not be more than 15 to 20 percent of the grist. Similar to other medium crystal malts, 60L provides strong caramel flavors and sweetness. It has less of the burnt sugar and raisin character produced by darker crystal malts. While, still being more flavorful than the lightest crystal malts. All crystal malts are produced by a stewing process, where they are roasted with high moisture content to caramelize their sugars. The heat from this procedure destroys the mashing enzymes, so the addition of base malt with extra enzymes is needed to allow conversion of the starches from the crystal malt. 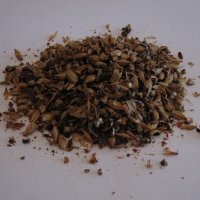 Crystal malt provides essential maltiness and caramel flavors for Scotch ales, porters, and stouts. It is also good for Dopplebocks and other dark lagers such as oktoberfest. Smaller quantities can provide some depth of flavor in pale lagers and ales.